Does Social Media Really Have POWER? So in theory, if you are “doing or accomplishing something” with social media you are leveraging the power behind it. 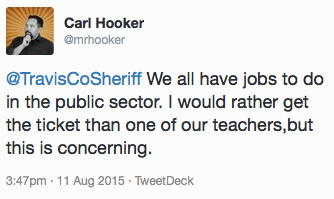 Again, a very nebulous explanation to me. I spend many days out of my year speaking to parents and students in our local community about social media. While most of those talks center unfortunately center on cautionary tales and things to watch out for like this Yik Yak post from last year, I also try and mix in some good things about social media. I’ve seen first hand the power of connecting with people via Google Hangouts when it comes to solving a problem or working on a project together. I’ve used Pinterest to help communicate ideas with community parents (and my wife). The past couple of years I’ve utilized Facebook groups to host Weight-Loss challenges with my friends across the country. These are very useful ways to utilize social media, but I never really viewed them as all that powerful. 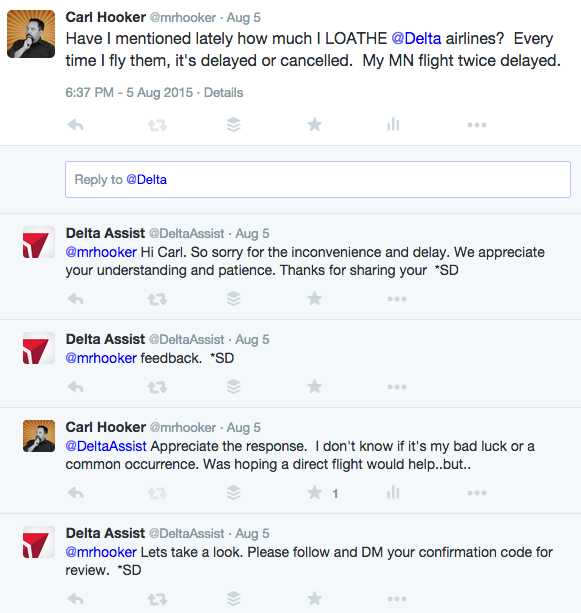 During two summer trips I had bad experiences with both Delta and United airlines. Flight delays happen, but these were extremely frustrating in the sense that neither were due to weather. 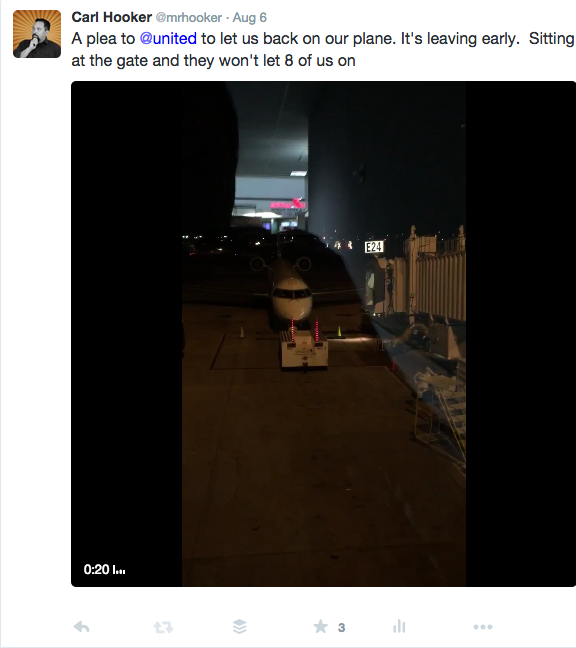 In the case of United, I even got to watch my connecting plane sit at the gate while I stared (and recorded) my plea out the window. Through a series of DMs that I’ll keep private, Delta reached out and actually granted me a credit for the next time I fly with them. Talk about instant power! I attempted the same with United, but for some reason their social media account was pretty anti-social so I took to good ol’ fashioned email to get my refund. What I gained from this is that industries have a social image to maintain and when we take to social media to vent about their service, it could potentially hold more power than an email. It means me and my 9,963 followers (maybe I’ll hit 10K after this) also get to weigh-in and see the experience I am having. This isn’t a post about “get as many followers as possible” but I do think having the support of a large group helps with leverage when it comes to customer service issues like these. I follow a lot of local news on Twitter and some of the local news follows me back (which is scary to think I have anything newsworthy to share). 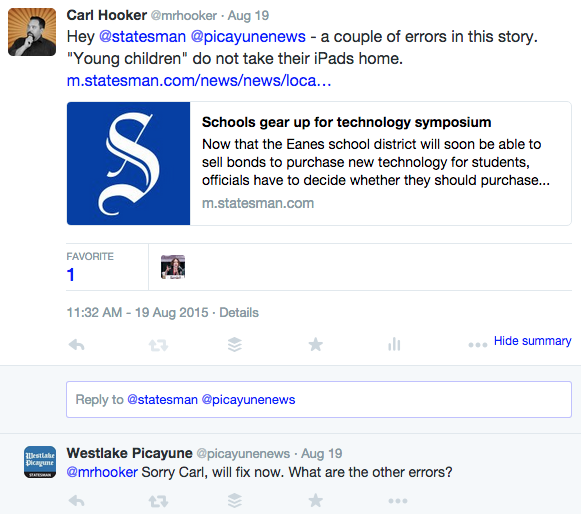 The Westlake Picayune (@picayunenews) recently posted an article about our upcoming Digital Learning Symposiums but had a couple of errors. Rather than call and spend time on hold or leave a voice mail, I took to twitter and got an immediate response and correction. When showing the Star Wars films to your kids for the first time, which film should you start with first? Episode 1 or New Hope? To more lengthy explanations like Phil Hintz’s post and accompanying research from Reddit. Having had so many powerful and successful examples of using social media to help me through life, I headed into the school year feeling cocksure and ready to take on the world. A couple of days before school started, I was utilizing my “pick-up truck” skills to help iVenger Jennifer Flood move from one campus to the other. With Westalke High School under some major construction this summer, my parking options close to the back door in the 100 degree heat were limited to a handicap spot or a fire lane. Thinking I would only be 15 minutes, I opted for the fire lane. 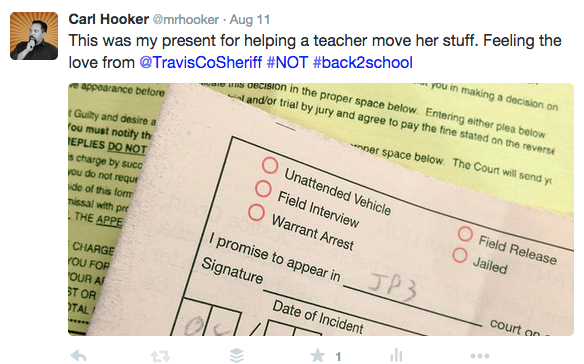 When I returned to my truck, I had a souvenir from the Travis County Sheriff’s office waiting on my windshield. I know that sharing these personal examples can be very ego-centric, but showing real-world examples from my life versus some I found online I felt packed a bigger punch. Do you have similar stories? I would love to hear them! Comment below, tweet me, Instagram me, or write me an old fashioned letter and share your experiences (both positive and negative) with social media. 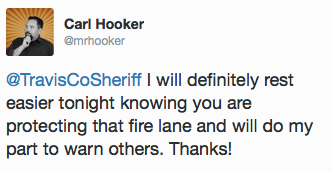 Until then, please continue to leverage this power for good rather than evil and remember kids….don’t park in fire lanes!